For good or ill, moving to a New York publisher after being a self-pub is like shifting from public school to a private one. You find yourself in a new neighborhood with different kids that look better than you. Kids who know all the fashion trends and are up on current events happening in Asia, while all you know is which alleys are safe to walk home through. These are kids you never expected to be playing with. Kids who dress in better clothes, who stand straight and talk with perfect diction. You don’t make friends easily, because they intimidate you and—you imagine—laugh behind your back. Who let him in? This is a school of privilege, of big names, famous names. I don’t know anyone here. I recently read A Moveable Feast by Hemmingway, which is a memoir of his early days spent as an expatriate in Paris. This was back when he was an aspiring writer, a moment in time touched on in the recent Woody Allen movie Midnight in Paris. In his depiction of the era, Hemmingway provides a portrait of a world where artists of the time all knew each other. They either bumped elbows at Parisian cafes, or were in correspondence with their fellows stuck in London or New York. I strongly suspect this is a very romanticized view that Hemmingway may not have intended. This idea that everyone in a given field knows each other has fascinated me. I often see famous comedians speak of having shared apartments with other famous comics during their struggling years. 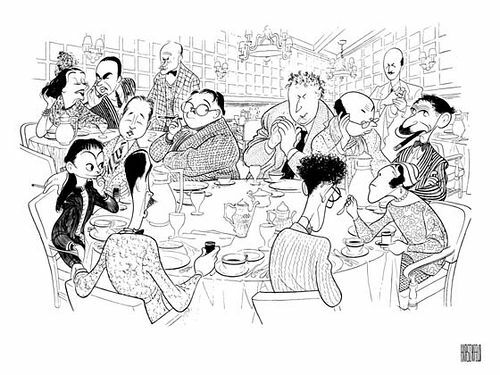 Actors all either went to school together or bussed tables at the same restaurant. Tolkien and Lewis were good friends and visited the Eagle and Child pub regularly, and Hemmingway and Fitzgerald were drinking buddies in the many haunts of France. How does this happen? Over the long years when I was learning I never met another writer. This idea of an artistic community that is connected and supportive or even competitive with friendly rivalries is appealing to just about everyone, particularly artists, hence the Allen movie. But as I said, I doubt it was ever truly that way in the 1920s. How could it be when the Algonquin Round Table and Harlem Renaissance were in New York, The Bloomsbury Set was in England, The Lost Generation was in Paris, and Steinbeck, Hammett and Chandler were on the west coast? Nevertheless the very existence of these informal social salon-like gatherings suggests a cohesion of artists that I don’t see today, or at least didn’t until recently. In reflecting on Hemmingway’s Paris, I began to draw correlations to today, but it wasn’t until I was speaking to my wife about other up-and-coming writers that I began to see connections. The reality is that the artistic landscape has become far less romantic but far more global, as the literary communities of old have reappeared—on the net. Twitter, forums, and sites like Goodreads are the new salons, and it is here that I have met and begun to know my fellow authors. I also discovered how it happens—how artists come together, how they end up knowing each other. Imagine crash landing on a desert island with ten other survivors. You aren't too likely to just walk off and separate yourself, winging it on your own. People trying to survive in a hostile environment tend to gather together for mutual benefit even if they compete for the same food sources. And the literary field is a very hostile world, like one of those computer games where each level is harder than the last, and there’s always an impossible boss mob you have to defeat before advancing. Authors are desperate people. We’re starving for any forward movement and no one understands that more than another author. If you have ten fans and I have ten fans, by helping each other out, maybe we can both have fifteen? No one says this. There are no formal or informal alliances. We aren’t that smart and tend to be far too proud, fair, and honest for such backroom antics. But we can’t help our subconscious. If you think it’s great that the author of a well-known book responds to your email, or tweet, it is ten times that when another author compliments your book. Not only is it just plain cool that they took the time to write you, but they also took the time to read you. That right there is fantastic, but then you have the additional godsend of all of those author’s fans seeing that comment and noticing you for the first time. This is one of the reasons authors connect, for mutual advancement. I saw it happen a lot in the self-pub world. Some even made pacts to rave about the other’s book regardless of their true feelings. I found myself in one of those once, but couldn’t do it. Luckily the other author had not posted about my book and I was able to break the deal. It pissed them off. “This is how it’s done.” I was told. I couldn’t do it and this made me some enemies early on. Nothing like that has happened since I came to Orbit, but I can see the benefit of author cross-promotion and just plain friendship. I know editors who get nervous when authors talk to each other the way one might seeing two ex-lovers having lunch and hearing their name come up. Apparently we are all a bunch of thieves and assassins, so don’t mess with us. Especially Lawrence, that guy is crazy. As you can see, I’m the number one “also bought” on Mark Lawrence’s page. Prince of Thorns is highly respected on the forums and hit a number of the Best of 2011 lists. So what could I do, I had to read it. Lawrence is dark. He makes the total absence of light feel pale. I’m not a huge fan of cynical fantasy, but while I was snooping around looking at reviews for his novel I read one that respectfully rejected it on moral grounds. Even the reviewer could not denounce his writing, but they rejected the book because Lawrence appeared unapologetic. I suppose if I had read ten “great book, must read!” reviews I would not have been as interested as I was after that one negative review. It bothered me that such an accusation would be leveled at an art form with the suggestion that Lawrence himself may be morally consistent with his characters if he did not in some way indicate otherwise in the novel. I immediately bought the book and started reading. I’m now sixty pages into Prince of Thorns, and I am deeply impressed with the writing. I did not expect to enjoy this book as much as I am, which given my predisposition against gritty fantasy, attests to Lawrence’s tremendous talent. I haven’t gotten around to either Douglas Hulick or Mazarkis Williams, but I will be looking at their books soon. Then one day, when we all find ourselves in a café or pub I will be able to chat intelligently and write my own memoir about the heyday of fantasy literature just after the turn-of-the-century and how I knew the greats before they were required reading by high school English teachers. It's funny, you (whose books I love), Sprunk (the first book is a little better than the second but they're both very good), and Hullick (his book was one of my favorites of 2011) are 3 of my favorite new fantasy authors, I also have Prince of Thorns on my books to read pile. All three series have similar themes but they approach them very differently, and the writing styles aren't too similar. My other favorite new author is probably Daniel Polansky's and his book Low Town. It also features an anti-hero thriving in the underworld of a city. He's probably the most similar to your books out of the other authors you listed. While his books are much more gritty and dark, the main character has a massive history that is relatively unknown to the reader. Like your books, the story found within is just an exciting small part of an intriguing character's long life. Absolutely Gregory, and I'll be blogging about them and other indies real soon. BigZ, I met Daniel at the Baltimore Book Festival. He and I were signing together and chatted during most of it as the pouring rain kept most fans away. Later I stayed for his reading. Still I must say I hate Daniel. Why? Because Low Town is the very first book he ever wrote--not published mind you--wrote. And he's like twenty-something. Sigh. If you feel intimidated at that private school tomorrow just remember that it exacts a heavy tuition. If you couldn't pay it, you wouldn't be there, so you're just as good as every other kid there. Besides, just smile casuallly and everybody will think you're the in-est of in crowds, and wish they knew you. How Has It All Come Down To This?